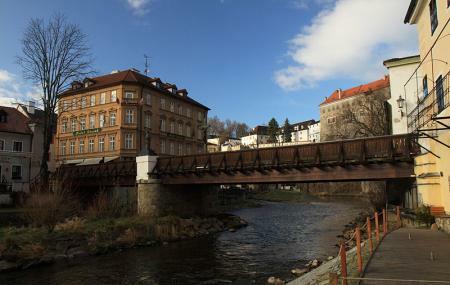 Lazebnický Most is a wooden bridge which connects Latrán with the Inner City and dates to the 1930’s. It stands on two stone supports and a central pillar and has been decorated with cast-iron sculptures of St. John the Baptist and Crucified Christ. Lazebnický Most truly is an exemplary example of a valuable transport engineering of those times. The bridge was restored in 1980’s and recently underwent a very expensive reconstruction. The bridge’s design is truly worth appreciating and you would also be rewarded with fantastic views of the Krumlov castle from here. If you want have a look on the city from different angle take a boat/raft and enjoy it! The city is well prepared for such kind of tourism too and the river is the best to cool down during hot summer days. The city is beautiful from all sides... It's one of real jewels of Czech Republic! Small bridge with great view. One bridge in Cesky Krumlov that resembles Prague's Charles Bridge a bit. Nice place to stop for a while, where you can watch boats sailing by and enjoy the panoramic scene around you: castles, hills, and stream of river. A really great and wonderful place to sightsee. Come early in the morning or late in the evening for great photos and limited tourists. Be careful of the pickpockets.